Google has released a series of new ads, highlighting that the Google Assistant is now on Smart Displays, including Google Home Hub, Lenovo Smart Display and JBL Link View, and illustrating the variety of things you can get done hands-free. One of the spots features a man asking Google on his Google Home Hub to look up 15-minute taco recipes, another man, whose hands are both busy, as he holds a mirror, asking Google to show him the front door, a woman with blue air asking directions to the nearest salon. Awkwafina also makes an appearance. Seated at a table and eating, she asks Google to show her calendar. Reminded that she has a phone call with Music Manager, she drops everything and rushes out. The commercial ends with the tagline “Make Google do it” flashing across the screen and with the voiceover saying “A little help you can see. Google Assistant, now on smart displays.” The three smart displays, Google Home Hub, Lenovo Smart Display and JBL Link View, are also featured. This is not the first Google ad Awkwafina stars in. In a previous one, the rapper asks Google to show her photos of healthy succulents to compare to the brown plant she’s holding and she’s not too excited with the results. 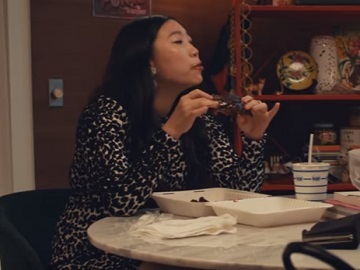 Awkwafina is the latest in a growing roster of celebrities, that includes Sia, John Legend and his wife, model Chrissy Teigen, and Kevin Durant.